Healthy Desk-Side Snacks. Smart Ideas for a Busy Day. Some days all I have time to do is sip, slurp, crunch and munch. Hand to mouth, eyes on the computer screen. Not so glamorous, I know. Super busy workdays leave me with no time for a thoughtful midday meal. So how do I get through the day fully fueled and energized? 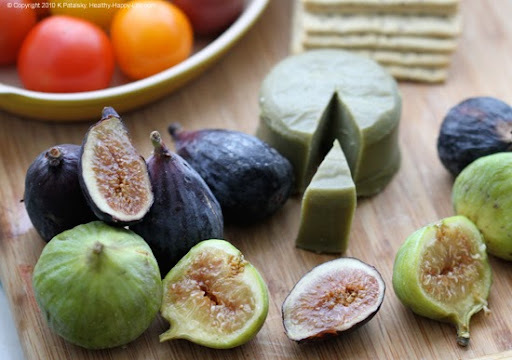 Smart Snacking! 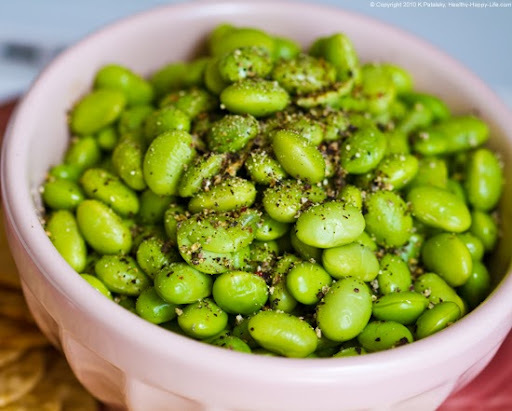 Heat up some frozen edamame in the microwave and pop it into a to-go container. Bring along some rice crackers. 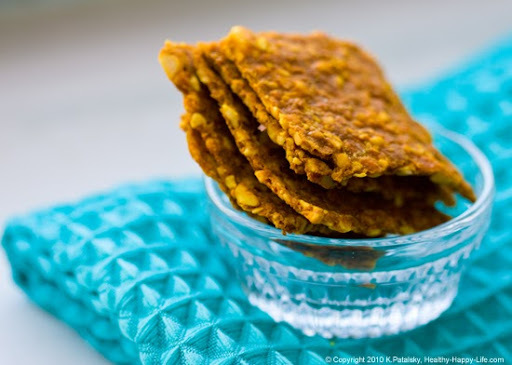 Desk-side, grab this snack when you need a super boost of protein, fiber - and crunch appeal. 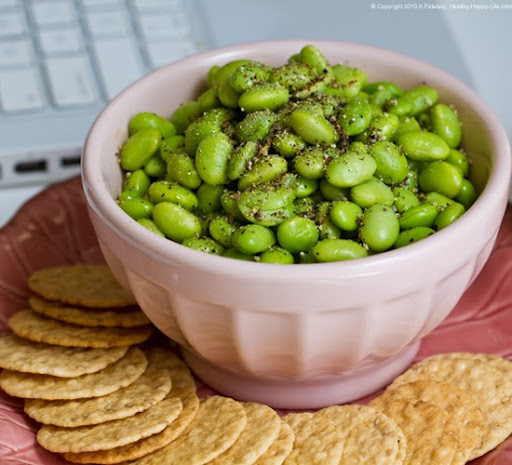 I add plentiful black pepper to my edamame and a dash of soy sauce or sea salt. Try some cayenne-dashed carrot juice on the side. 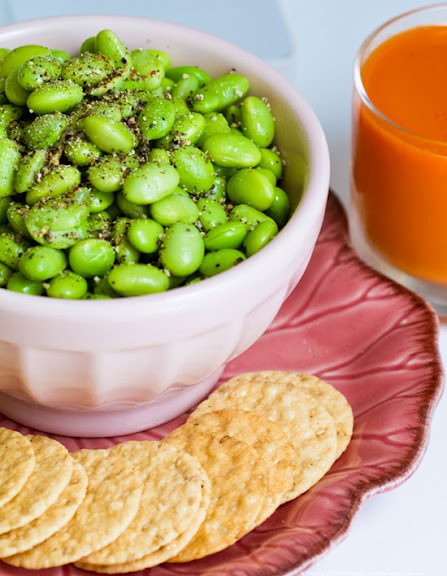 This recipe is also great for kids - see a kid-friendly edamame snack here. 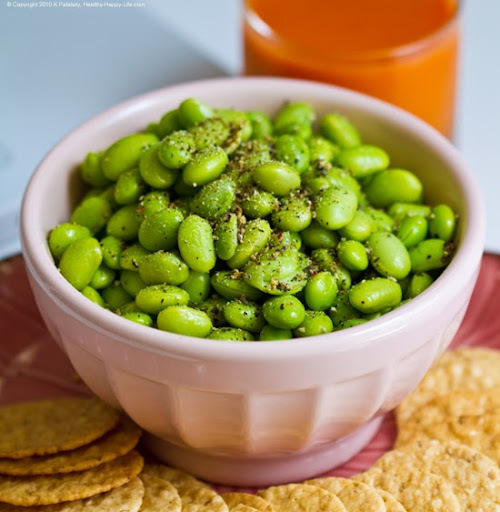 If you'd prefer, sub edamame with healthy peas. Classic kid snack: ants on a log. Grown-up modifications are easy and delicious. Grab the classic base: celery sticks and slather them in nut butter (peanut or almond). If you prefer, switch up the raisins for cranberries, pumpkin seeds, sesame seeds, hemp seeds, flax seeds, spicy cayenne, black pepper, harissa, a few dried cherries or even dried blueberries. For a sweet treat, drizzle maple syrup over top as you crunch. 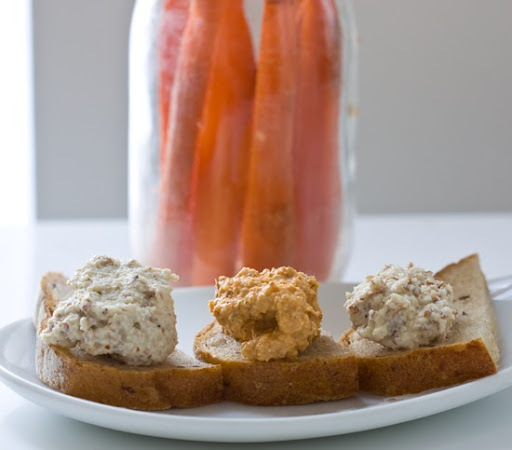 Another idea: substitute nut butter with bean dip like hummus. This is my favorite desk-side snack. Here's how you do it: Plan ahead for your snacking week and make a big batch of raw almond spread. Store it in the fridge and bring a portion to work each day - along with some fresh veggie sticks and maybe a few easy pita triangles or healthy crackers. This dip is packed with raw nuts, fiber and protein - this snack will get you through a busy, hungry day. 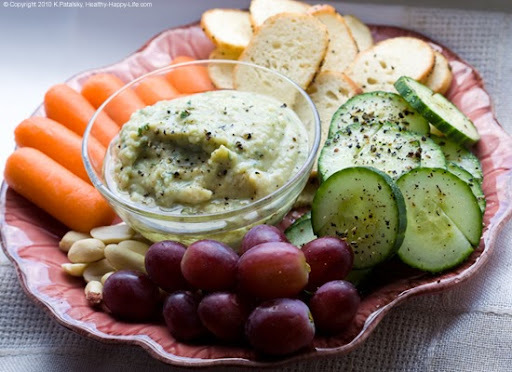 Try these three raw almond dip recipes. Too busy to chew? That's OK. Venture out to get a smoothie - or beg your office to get a in-break-room blender. If you work from home - you're set. Add fresh/frozen fruit, nut butters, seeds, seed oil, raw nuts and a variety of liquid bases to your smoothies. Get some healthy vegan smoothie recipes here. 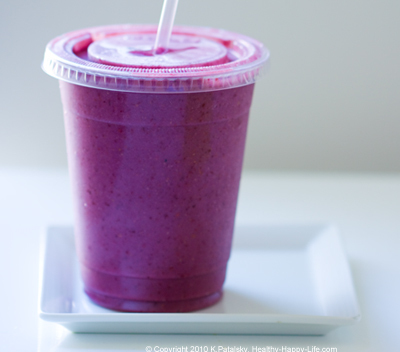 Or snag my Smoothies iPhone App for on-the-go smoothie success. We all love elaborate sandwiches, wraps and pitas. But sometimes a simple stuffed pita will satisfy your needs. My perfect easy pita: 1) Whole wheat or soy pita half. 2) Garlic or spicy hummus 3) Raw baby spinach - lots of it. Stuff it in and chomp desk side. You can even bring the ingredients separately to work and assemble as you eat. Not so glamorous I know - but it is delicious and healthy! Leafy green antioxidants from the spinach and fiber and protein from the pita and hummus. Sip a mint/lemon iced tea or a fizzy mint mineral water to add a touch of sophistication. ...Bored by spinach? Try any of these ten healthy leafy greens here. An easy desk side snack I love mid-morning - nuts and berries. I'll fill a big bowl with raw cashews, roasted almonds, raw pumpkin seeds and Brazil nuts. One of my faves: walnuts. Then I will mix in a cup of fresh blueberries or blackberries. 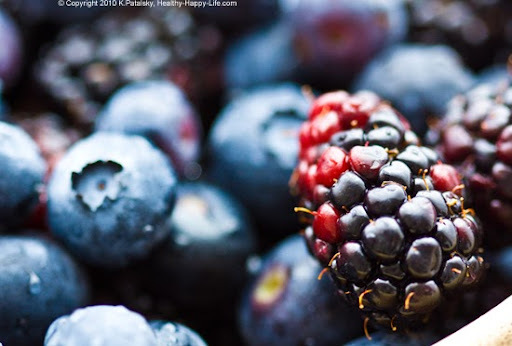 The nut/berry combo is delicious, hydrating, antioxidant-filled and full of fiber. 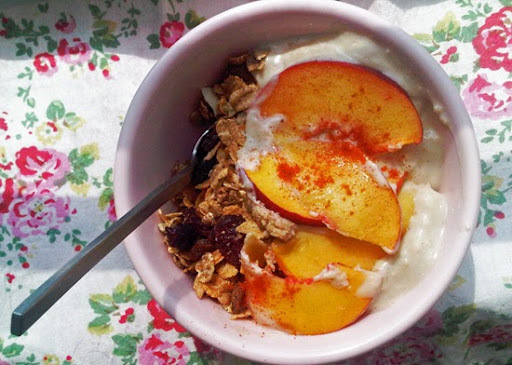 Snack smart and feel good in the morning. Sure beats a pop-tart. A bowl of nuts along side a fruit smoothie is another combo I love. Fill a to-go container with some salsa, hearty/healthy low-fat bean dip or smashed black beans, sliced lime-soaked avocados and some chopped cilantro or jalapeno. Close it up and tote along a bag of whole grain tortilla chips and veggie sticks. I like carrots and jicama with this spread. Go easy on the chips though - just a few will get you dipping - this snack is really all about the beans, spicy salsa and avocados. A few whole wheat tortillas could sub for chips. Desk side mini fiesta for you. This is so easy it's excuse-proof. Make a chai latte - only fill the mug 3/4 of the way full. Add chai mix, soy milk, a dash of cinnamon and cayenne. Now the fun part: before heating, add in a scoop of raw or roasted cashews (or any nut) and a few dried goji berries. Heat and sip desk side. When you finish your chai drink you will have a nice serving of soaked nuts at the bottom of your mug. Eat them - they are delicious! Plus soaking nuts eases digestion for some. This idea may sound strange - but give it a try! You can soak nuts in your tea, chai and even your coffee/espresso latte. Goji Berry Chai. This idea isn't creative or new - but it works! If you've ever seen that Seinfeld episode you know what I mean by... "...but a muffin can be quite filling!" 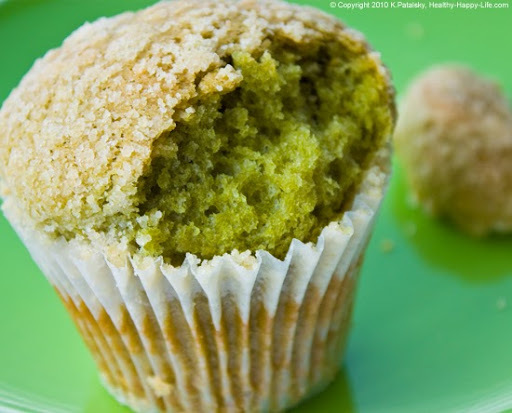 my advice - seek out a high quality/healthy store-bought muffin (Like Green Tea Ginger from Le Pain) - or better yet, make a whole batch of healthy muffins Sunday night - freeze them in little baggies and grab 'n go throughout the week. Muffin recipes here. I love this muffin recipe. Stack a to-go container with soy yogurt, nuts (cashews, peanuts, almonds, walnuts, pistachios, pecans, macadamia), seeds (hemp, flax, sesame, pumpkin), fresh fruit, dried fruit, muesli, granola, maple syrup, berry sauce, more nuts/seeds/fruit, more yogurt - and go. Pull your parfait from the fridge when you need a boost. Try a dessert-tasting soy parfait with silken tofu vanilla or banana pudding. 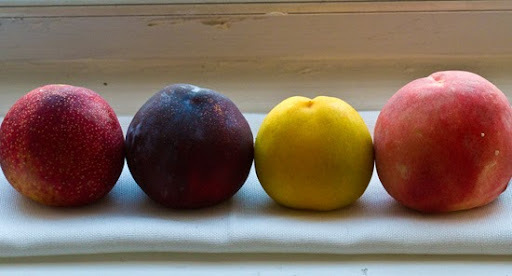 See my peach/banana pie-fait recipe here. I love this easy idea. Before you head out for your day, simply grab a ripe or extra-ripe avocado and a baggie of crackers (your fave kind - the thicker/grainier the better). When you need a snack, slice open the avocado and scoop out the flesh with your crackers. It sounds simple - but it is delicious. What, what did you say?? 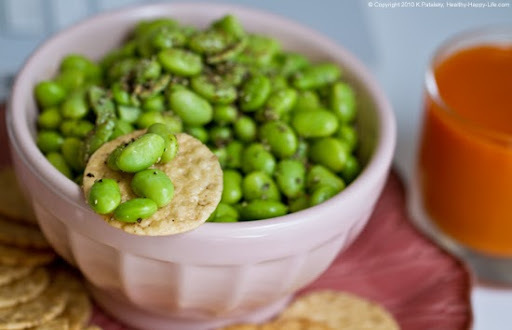 Before you grab the bag of potato chips consider these chip-like snacks: Calbea Snap Pea crisps - Soy Crisps - raw Cheesy Quackers - Two Moms in the Raw Crackers - Kale Chips - Veggie Booty - nutritional yeast "cheese" popcorn - air-popped popcorn with pink sea salt. And if you must go for potato chips - maybe try the sweet potato chips -- and always read those snack food labels! ...what is your favorite desk-side snack? ?